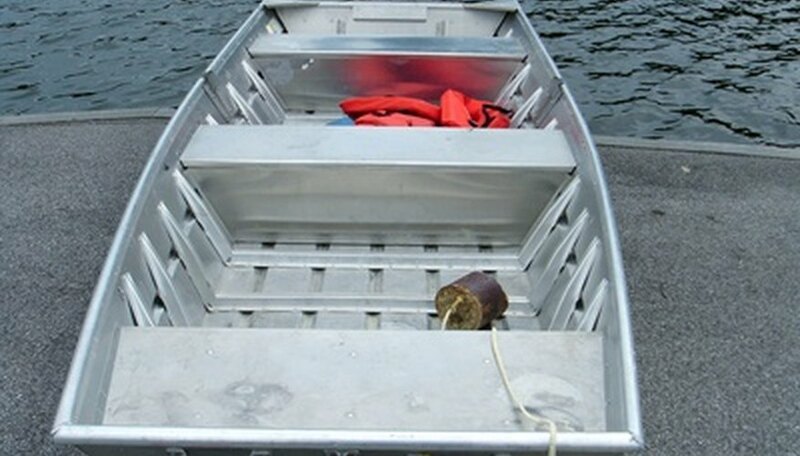 Aluminum boats are great for fishing lakes, ponds and shallow rivers. While most aluminum boats are operated by outboard motors using hand tillers, it is convenient to add a steering column to the boat. Steering columns on aluminum boats provide more accurate steering and efficient handling. There is also a safety benefit to having steering on aluminum boats since the operator does not have to twist and turn while steering, thereby possibly avoiding muscle strains. Measure the base of the steering console. Mark the measurements on the floor of the boat. Place console over the marked area and secure to the boat's floor by inserting the self tapping metal screws. The steering column is pre-attached to the console. Attach the cables from the throttle kit to the connections under the steering column. The connections should be labeled for easy connection. Extend the cables along the inside wall of the boat, from the console to the rear of the boat and attach to the outboard motor. Using the conversion kit for the outboard motor, connect the cables to the conversion kit. Secure the conversion kit in a convenient location near the motor. Lavelle Lemonier has been writing professionally since 1999 and is a published author, executive and freelance writer. His first novel, "Southerland Strength," was the 2004 Romance of the Year for "Shades of Romance Magazine." In 1993 Lemonier earned a Bachelor of Business Administration in economics from Lamar University.